The family of a man killed by a Johnson City (NY) Police officer after shooting and killing another officer is suing Binghamton and Johnson City, alleging that officers didn't follow police protocol when they responded to the incident and purposefully suppressed information after the fact. The lawsuit — filed on behalf of Jon and Cherrie Clark, the parents of James Clark, the man who was killed — comes three years after the bizarre and tragic incident played out in the parking lot of Southern Tier Imaging in Johnson City, leaving investigators and the community puzzling over what, exactly, happened to Clark on the morning of March 31, 2014. According to a 203-page collection of incident reports obtained by the Press & Sun in 2014 through freedom of information requests, Clark arrived at work around 7 a.m., speaking about magnets and terrorists. He called the police and told dispatchers that if someone brought a bomb into the country and attached it to one of the MRI magnets, people would die. 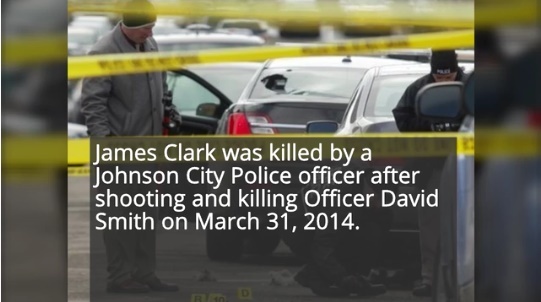 When Johnson City Police Officer David Smith arrived at the scene, Clark ran toward him, punched him in the face, took his gun and fired two shots to his head, killing him. A second officer, Louis Coici, shot and killed Clark, but not before Clark climbed on his back, attempting to grab his weapon, according to reports.